Wait, what? Admittedly I’m no Lego enthusiast, but first I find out that Lego has a line of ninja-themed sets, which are tied to a TV series. Then, I find out there’s a movie coming out this year (because one Lego movie a year is apparently just not enough). And to top it all off, it turns out that Samsung has made a tablet to promote the movie. Well, “made” may be too strong a word. This tablet runs Android 4.4 KitKat (yes, 2013’s hottest Android version) and seems to be a Galaxy Tab 3 Lite 7.0 VE (a 2015 model) stuffed inside this eye-catching case. To be fair, the Galaxy Kids Tablet 7.0 The Lego Ninjago Movie Edition – yes, that’s the full name of the tablet – comes with a thick case that can take the hardships of being a toy. 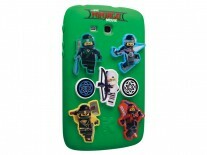 The 3D Lego ninjas on the back might also impress kids of a certain age. Those can be moved and swapped for some cool customization. 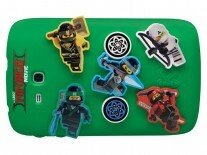 Those Lego ninjas can be moved and swapped – take that, MotoMods! Better still, the tablet comes pre-loaded with a selection of games and education content from DreamWorks Animation, Sesame Street and the National Geographic. You get three free months subscription to Samsung Kids.